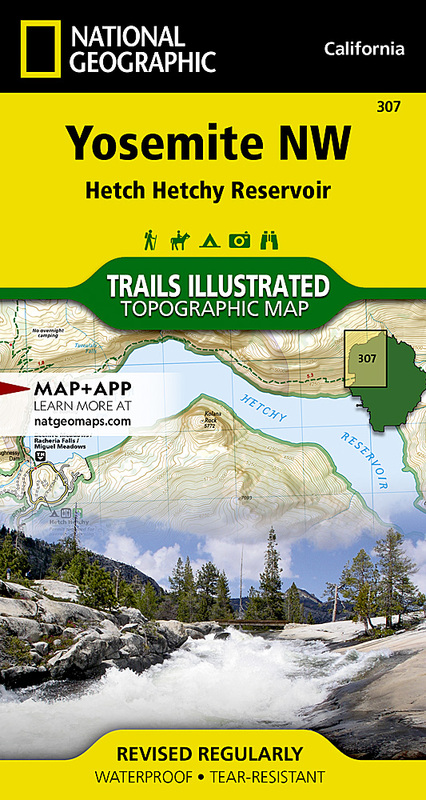 National Geographic's Trails Illustrated map of Yosemite NW: Hetch Hetchy Reservoir is designed to meet the needs of outdoor enthusiasts by combining valuable information with unmatched detail of this magnificent region of Yosemite National Park. Expertly researched and created in partnership with the National Park Service, U.S. Forest Service and others, the map's coverage extends from the park's northwestern border to the White Wolf area and features key points of interest of Yosemite Wilderness including Lake Eleanor, Grand Canyon of the Tuolumne River, Tilden Lake and Pate Valley as well as the Emigrant Wilderness in the neighboring Stanislaus National Forest. Get off the beaten path and back again by following precisely mapped trails with mileage markers, including portions of the Pacific Crest and John Muir trails, which are both highlighted. To aid in your navigation of the region, the map includes contour lines, elevations, labeled peaks and summits, water features and selected waypoints. Some of the marked recreation features are campgrounds, campsites, fee stations and ski areas. Ranger stations are clearly marked as well. Also included are camping, hiking, wilderness permit, and safety information. Other features found on this map include: Emigrant Wilderness, Lake Eleanor, Stanislaus National Forest, Yosemite National Park.